Have you cleaned your sails lately? Unsightly dirt, rust, mildew, salt, and other contaminants, can damage sails, affect their performance, and reduce their longevity. One of the most important items on your sailboat is its sails. 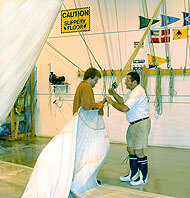 Sailmakers are acutely aware of the cost of sails as part of the total investment and operating costs of a sailboat. Just like changing the oil regularly to protect the engine, regular sail cleanings are just as important to the life of "the other engine" on your boat, even though sails represent a far more significant share of the total investment and life cycle cost of the boat. Sailors regulary clean the bottom of their boats knowing this is a primary factor in its performance; sails require the same attention. A sail laden with contaminants will not perform as originally designed or last as long. The Sail Cleaners specializes in cleaning all sail makes, types, and materials. Our process reduces sail damage and protects one of your most significant boating investments. The Sail Cleaners has cleaned thousands of sails, ranging in size from windsurfers to genoas of more than 7,000 square feet. We have the foremost sail cleaning facility in the U.S.A., with the most modern, scientific method for treating sails and canvas. Visit secondwindsails.com to buy or sell used sails. Copyright © 2004 by The Sail Cleaners. All Rights Reserved.